If you have a car, do you start it up and let it idle for hours before you drive it? That would be a senseless waste of gasoline and wear on your engine. Firing up kitchen equipment and house lights too early can be similarly wasteful. For normal cooking (when the cooking throughput is 15 minutes or more), the required start-up time is usually about 20 minutes. For heavy cooking, most equipment only needs to warm up for about an hour. Create a simple start-up and shut-down schedule to offset these wasteful costs. For example, Shari's Cafe and Pies saves $4,145 per year per location with their schedule (see toolkit below). Want to keep your utility costs from guzzling your hard-earned money? 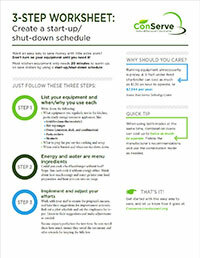 We've created a start-up/shut-down schedule to help you manage your energy use. All you need to do is keep your appliances turned off until you need them. Download our start-up/shut-down toolkit and develop your own schedule now. By integrating start-up and shut-down schedules into your operational practices and staff training, your restaurant can reduce overall energy use, cut energy use at peak rates and save money.